Tesla is counting on the Model 3 to help it become profitable. Now Musk is pushing boundaries in the factory that makes them. Most automakers test a new model's production line by building vehicles with relatively cheap, prototype tools designed to be scrapped once they deliver doors that fit, body panels with the right shape and dashboards that don't have gaps or seams. Musk's decision underscores his high-risk tolerance and willingness to forego long-held industry norms that has helped Tesla upend the traditional auto industry. While Tesla is not the first automaker to try to accelerate production on the factory floor, no other rival is putting this much faith in the production strategy succeeding. Musk expects the Model 3 rollout to help Telsa deliver five times its current annual sales volume, a key target in the automaker's efforts to stop burning cash. "He's pushing the envelope to see how much time and cost he can take out of the process," said Ron Harbour, a manufacturing consultant at Oliver Wyman. Investors are already counting on Tesla's factory floor success, with shares soaring 39 percent since January as it makes the leap from niche producer to mass producer in far less time than rivals. There are caution signs, however. The production equipment designed to produce millions of cars is expensive to fix or replace if it doesn't work, industry experts say. Tesla has encountered quality problems on its existing low-volume cars, and the Model 3 is designed to sell in numbers as high as 500,000 vehicles a year, raising the potential cost of recalls or warranty repairs. "It's an experiment, certainly," said Consumer Reports' Jake Fisher, who has done extensive testing of Tesla's previous Models S and X. Tesla could possibly fix errors quicker, speeding up the process, "or it could be they have unsuspected problems they'll have a hard time dealing with." Musk discussed the decision to skip what he referred to as "beta" production testing during a call last month with an invited group of investors. Details were published on Reddit by an investor on the call. Musk also said that "advanced analytical techniques" – code word for computer simulations - would help Tesla in advancing straight to production tooling. The auto industry's incumbents have not been standing still. Volkswagen Group's Audi division launched production of a new plant in Mexico using computer simulations of production tools – and indeed the entire assembly line and factory - that Audi said it believed to be an industry first. That process allowed the plant to launch production 30 percent faster than usual, Audi said. An Audi executive involved in the Mexican plant launch, Peter Hochholdinger, is now Tesla's vice president of production. Tesla's decision to move directly to the final tools is in part because lower grade, disposable equipment known as "soft tooling" ended up complicating the debut of the problem-plagued Model X SUV in 2015, according to a person familiar with the decision and Tesla's assembly line planning. Working on a tight deadline, Tesla had no time to incorporate lessons learned from soft tooling before having to order the permanent production tooling, making the former's value negligible, the source said. "Soft tooling did very little for the program and arguably hurt things," said the person. 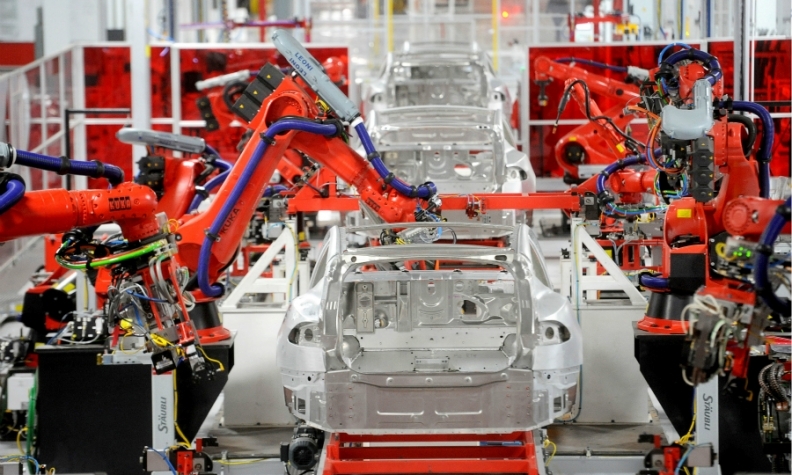 Robots help assemble Tesla Model S sedans at the company's factory in Fremont, California. Financial pressure is partly driving Tesla's haste. 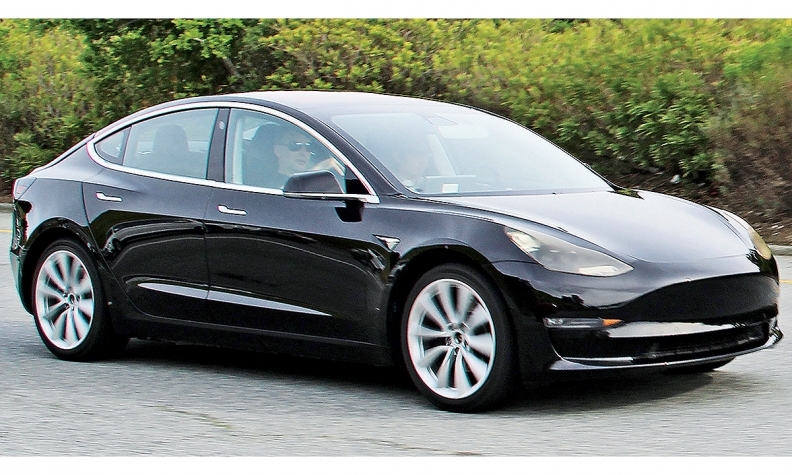 The quicker Tesla can deliver the Model 3 with its estimated $35,000 base price to the 373,000 customers who have put down a $1000 deposit, the closer it can log $13 billion. Tesla has labored under financial pressure since it was founded in 2003. The company has yet to turn an annual profit, and earlier this year Musk said the company was "close to the edge" as it looks toward capital spending of $2-2.5 billion in the first half of 2017. Tesla has since gotten more breathing room by raising $1.2 billion in fresh capital in March and selling a five per cent stake to Chinese internet company Tencent Holdings. Musk has spoken to investors about his vision of an "alien dreadnought" factory that uses artificial intelligence and robots to build cars at speeds faster than human assembly workers could manage.